Renderings and aerial photo courtesy of LBX. After being approved nearly two years ago, the massive, 26-acre Douglas Park development known as the Long Beach Exchange (LBX) is nearing completion—and will be bringing both national and niche brands to its 266,000 sq. ft. of retail space, including speciality coffee powerhouse Portola Coffee’s first location outside Orange County. Here’s to hoping that that Burnham-Ward Properties development—the crew behind the South Coast development known as The OC Mix and whose main honcho, Scott Burnham, proclaimed confidently that this is “unlike malls of the past” at its groundbreaking while still presenting a sprawling, uninspiring design—continue to cater to more independent brands like Portola, thus far the only non-chain to be invited into the development. “McGowen’s Approach,” the pedestrian promenade at the entrance, is named after Jackson McGowen, the original president of Douglas’s aircraft division. “The Landing,” featuring time line installations on local aeronautical history and a grand-scaled 1.25-acre central plaza. 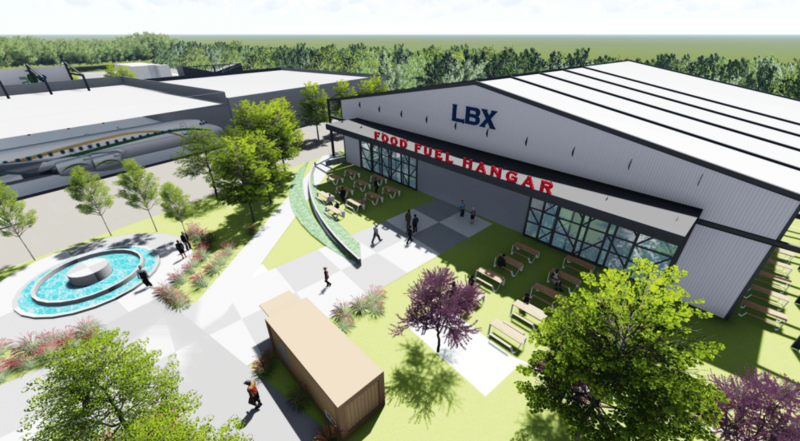 “The Hangar,” a 16,800 sq. ft. pseudo-replica of an aircraft hangar, the area which will house Portola and other “craft”-oriented shops and restaurants—in other words, it will be Douglas Park’s attempt at a SteelCraft-like hangout. It is expected to open formally this spring. LBX is located 3991 N Lakewood Blvd.